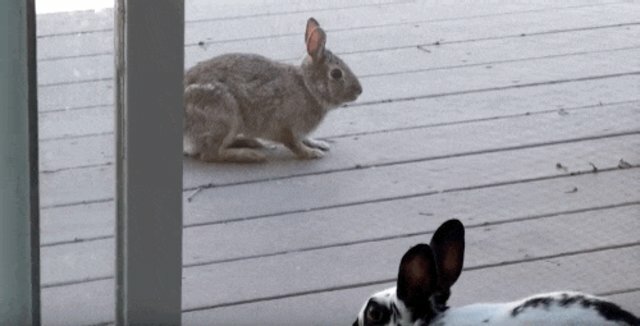 This wild rabbit got an unusual look into the world of domestic bunnies - and he likes what he sees. 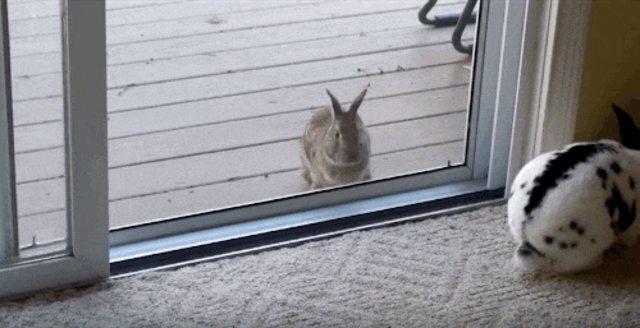 YouTuber bill16504 decided to open his sliding door one warm spring day, leaving his rabbit, Pep, sitting in her favorite spot in front of the screen. 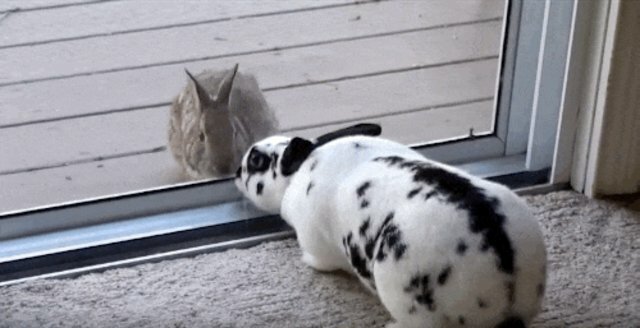 Soon they had an unexpected visitor in the form of a curious wild rabbit. 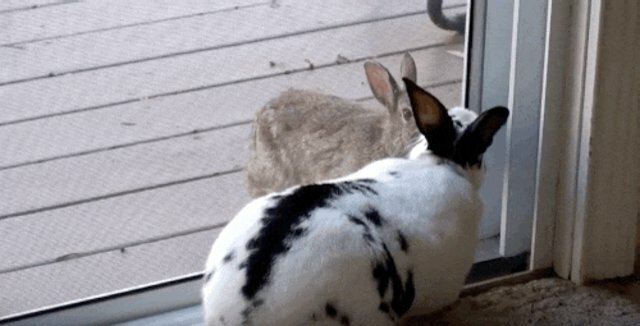 The wild rabbit appears to be quite taken with Pep. And after a brief standoff he decides to approach. Pep seems equally taken with him, nuzzling him through the screen. ... which stands firm even as he tries to climb through it. 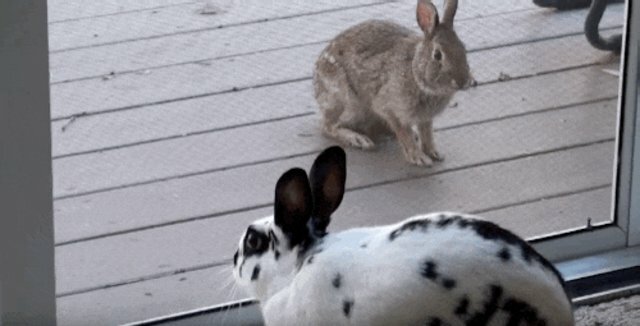 The video description mentions that the wild rabbits were in the midst of mating season so it's possible this wild visitor had some amorous thoughts in mind (though domestic rabbits can't successfully reproduce with wild rabbits in the U.S. as they're too genetically dissimilar). It could also be that curiosity overcame his natural caution. In any case, the wild rabbit was much bolder than the house bunny - who quickly retreats to her cardboard box in the face of all the attention. But her suitor isn't giving up. Unfortunately for these lovebirds (but probably wisely) the owner didn't decide to open the screen. 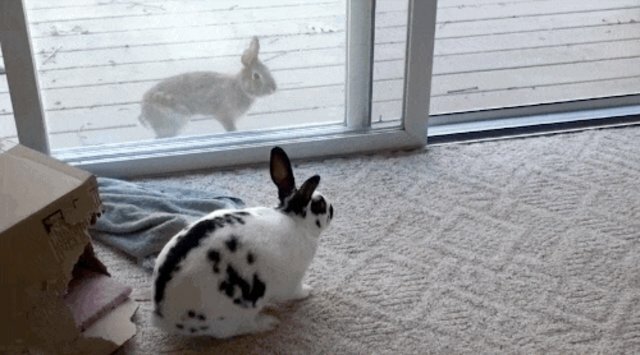 It's a tragic love story for the ages - though hopefully the wild rabbit found a better target for his affections. 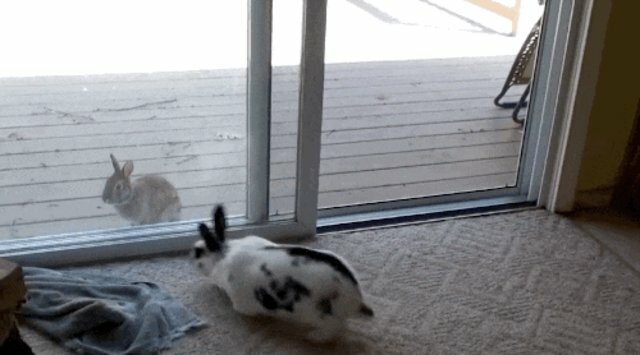 The video is a good six minutes of escalating rabbit courtship; you can watch the full clip below. If you'd like to bring a house rabbit into your life, make sure you do your research and visit Adopt-a-Pet.com for adoptable rabbits near you.